Missing Link, the newest film from the stop motion maestros at LAIKA, epitomizes everything great and frustrating about the company. It’s charming, human and fun, the jokes are on point and the characterization refuses to take the easy way out (at least for its heroes). The dialogue is excellent and Jackman is the embodiment of Sir Lionel making for an experience that flows effortlessly. Unfortunately it’s also a film which is made for seemingly no one, or at least such a select group I fear how long we’ll be getting more of the treasures. It shouldn’t be like that. The plot is appropriately high concept enough: a lonely Sasquatch(Galifianakis) decides to leave the Pacific Northwest and go live with his cousins, the Abominable Snowmen, so that he will no longer be alone. To do that he hires the foremost monster hunter in the world – and only person who believes he exists – Sir Lionel Frost (Jackman) to get him safely to the Himalayas in exchange for proof he exists, proof enough to please the doubters at the Explorers Club. It won’t be an easy journey, with jealous adversaries and crazed hunters (Olyphant, doing a great Sam Rockwell impression) on their trail every step of the way. All of this is to the good and should be accessible for everyone. The dialogue from writer-director Chris Butler is excellent as are the site gags which are the best since Box Trolls, maybe ever. Even when the set-up is extremely obvious they still work. Many of the punch lines are just as good, benefitting tremendously from Galifianakis’ line readings. But it’s really Jackman who is the beating heart of the film, not the least because he is the character undergoing transformation but because in many ways Sir Lionel all of Jackman’s best instincts brought to the fore. He’s dashing, brave, arrogant, not above a little larceny in a good cause and he even gets to sing! But it often feels like a lost cause. 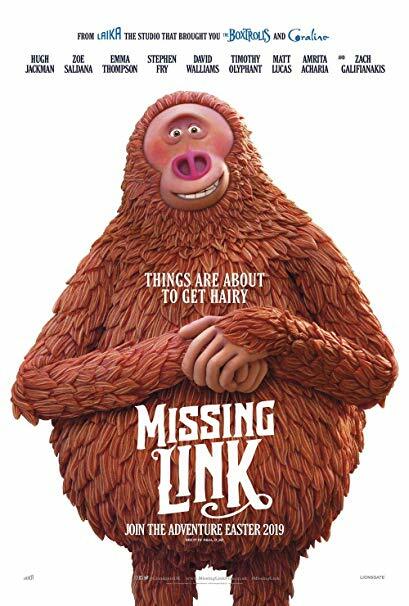 Missing Link is made for a group which will probably not care for it because it has the form of a family oriented animated film but contains a wholly different substance. (The themes are not that far off from you typical family fare or even for many studio melodramas, focusing on the need to be true to yourself and reject desires to change yourself in order fit into a larger group. Its right up there with ‘believe in yourself and anything is possible’ as Hollywood’s favorite modern moral.) However, the younger audience which might like this kind of thing will likely never make it through Link’s more complex storytelling. This is an animated story for adults (or at least big kids) but they’ll likely never know. It also continues Laika’s quest to press the form to its technical limits; unfortunately it may have found them. More so than any previous film from the stop-motion specialists, Missing Link is an action film – or at least has long periods where it does a good impression of one. It’s the sort of thing which CGI can handle with ease and traditional cell animation can imitate with enough hand-waving we don’t really notice the difference, but in three-dimensional stop motion there is nowhere to hide. A side effect is that the film has a tendency to slow way down during the most adrenaline fueled moments as the characters go through their wind-ups and punches. What it gains in visual legibility it loses in momentum. [There’s been a lot of complaint about modern action films and difficult it can be to maintain a since of geography within them as cameras seem to get closer and closer and movement gets more juttery and abrupt. Missing Link suggests that between clarity and pace, pace in a set piece really does make all the difference]. If it’s lacking in anything (and lacking is probably the wrong word) it’s Laika’s incredible sense of visual style. Gone are the blazing oranges, tantalizing purples, strangely proportioned buildings and other elements of the fantastic which the studio has embraced as part of its animation heritage. Ostensibly set in the real world (a sort of Neverland of late 19th century England and America) Missing Link gives up idiosyncrasy for romanticism, painting a vision of reality which might not be out of place in a studio historical epic. Which means frequently it a wash of grays and browns, at least until Sir Lionel and his group find the lost valley of the Yeti’s deep in the Himalays. None of that really takes away from the strength of what Butler has done. It may not be the best Laika has ever managed, but it’s way up there, showcasing the thought and care everyone involved has put into the film. All in all it’s a great piece of animation filmmaking, one clearly made with love by its director and which answers his particularly filmmaking desires. Let’s just hope they get to keep doing that.